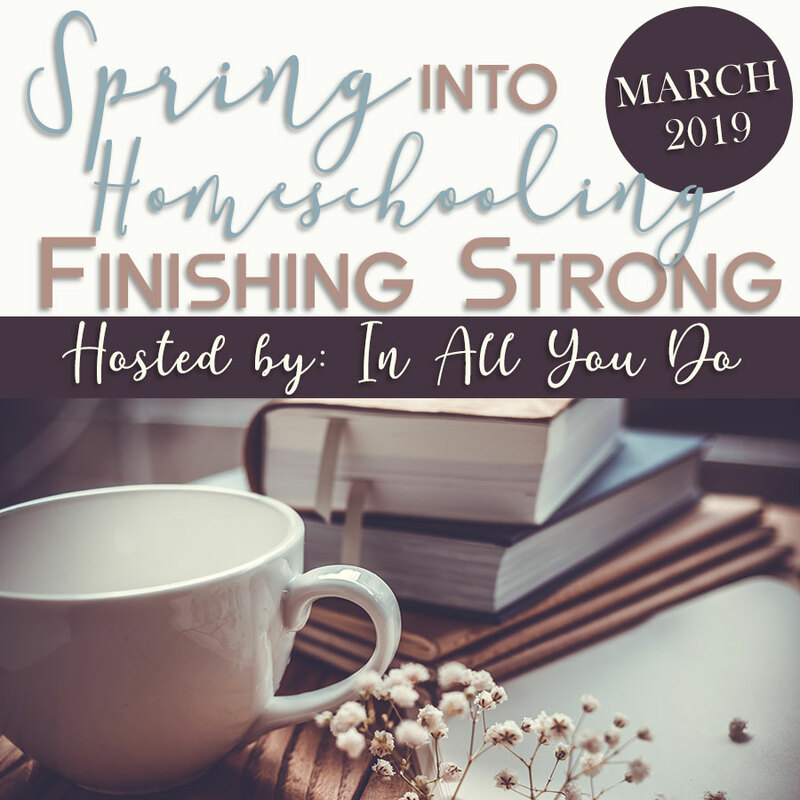 We are in our seventh year of homeschooling and truthfully…I thought it would get easier. I mean, I’ve taught three kids their numbers, letters, sounds and how to read. So why was our fourth child so hard to teach? She loves to color, draw and has the imagination of a Disney writer. 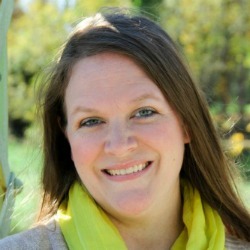 When we began Kindergarten with her last year, I realized very quickly she was struggling. The curriculum we used for the others is wonderful, but she just wasn’t grasping it. She just wanted to have fun. And it was fun…for a while. Until I saw she wasn’t retaining any of the information we had covered in previous weeks or even just days before. That’s when I knew we needed a change. Maybe a different approach would work? So, we tried more hands-on activities like our playdough mats to help her with more tactile learning of letters and numbers. It went well…for about 2 weeks. Then I realized once again, it just wasn’t clicking with her. She loved learning and could remember the words to songs she’d only heard once, but not the names of letters or numbers. I had to think quickly. She was falling further and further behind and was surely going to graduate without knowing how to write her name if we didn’t get this figured out. After all, she was FIVE and ready for Kindergarten, or so I thought. 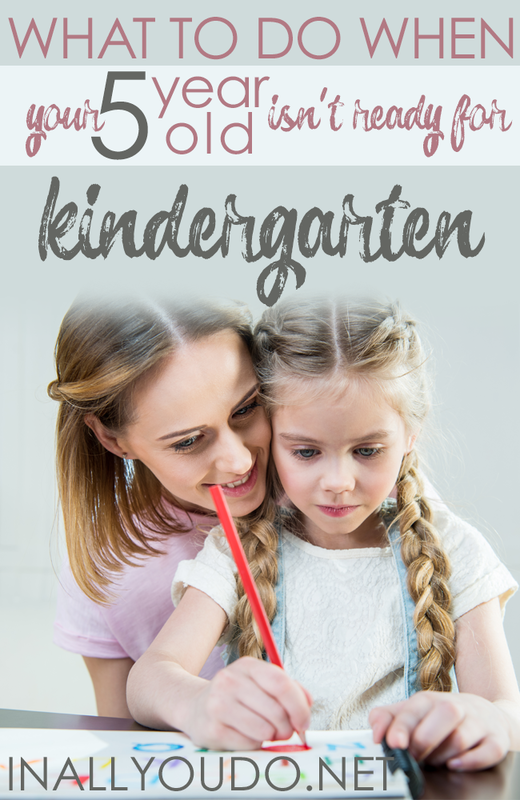 So, what if Your 5 Year Old Isn’t Ready for Kindergarten? As homeschoolers we pride ourselves on teaching each child at their level, not pushing them into a mold created by society. And here I was pushing her in to the “public school mold” just because she had turned five. However, as I thought about it more and more, I realized that had she gone to public school and started that year, she would have turned 5 after school started! That’s when I told my husband, we were waiting another year to officially start her Kindergarten lessons. So what do we do in the meantime? I had a plan! I knew we couldn’t just keep on “playing to learn” and not help push her along a little, yet I didn’t want to frustrate her either. I had been working on my next eBook and thought it would be the perfect solution. 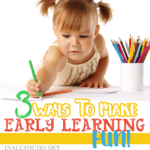 It was a fun combination of short lessons, fun activities that all led to learning letters. We could do as much or as little as she wanted combined with other activities to make them fun and hopefully help set the foundation for next year. I printed out the first letter in the book and was thrilled with her excitement. She loved working on her letters and doing papers like her brothers and sister. At this point, school was fun and she was now included. 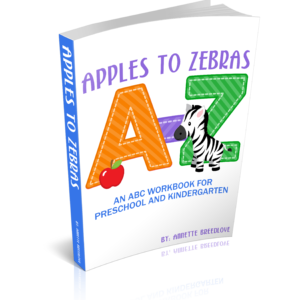 Apples to Zebras is designed for a 3-day week schedule, so we chose to do Tues-Wed-Thurs, as Mondays are usually very busy getting the older three kids settled back in to our school routine and Fridays my husband was off. However, you could easily expand the lessons to be a 4- or 5-day schedule. 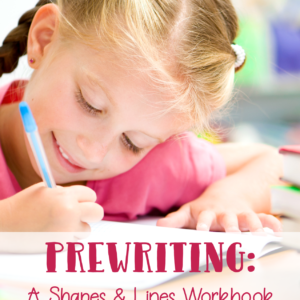 The lesson plans are flexible to fit a variety of learning styles while reinforcing the letters of the week. Every 4th week there is a review lesson to help them remember the previously learned letters. 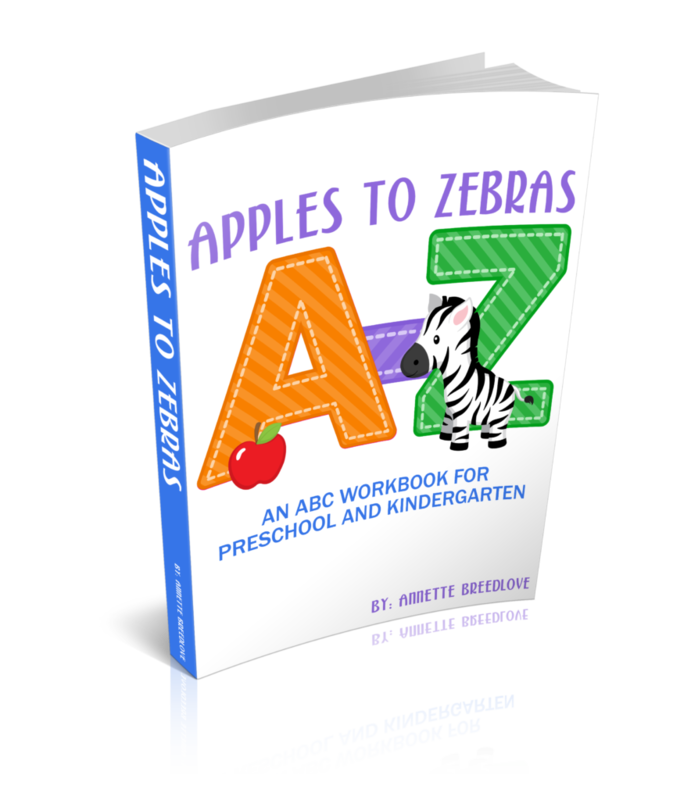 There are hands-on activities for every letter, plus some bonus printables at the end of the workbook – from puzzles to flashcards and more! 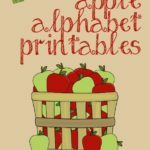 This 680+ page digital download is the perfect way to get kids started learning their letters while working on their handwriting and beginning sounds. My daughter has done well this year working through the book and enjoyed hands-on activities as well as the relaxed lessons. As we move in to Kindergarten this year, we will go back through these lessons and add in even more activities and learning opportunities, because I feel she is ready. We may still struggle, so I like that we can finish the “workbook” in 3 days, but do more or less depending on her comprehension of the letters. 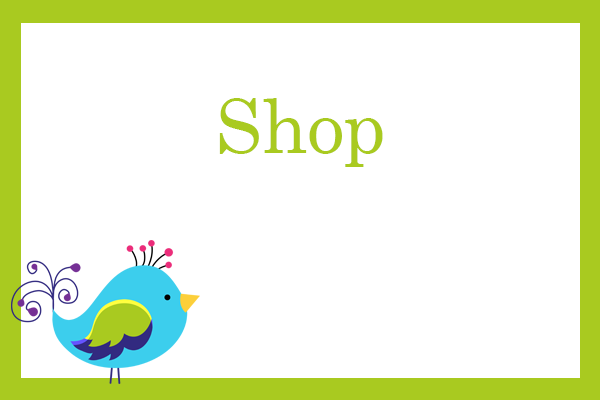 Simply add the product to your cart and at checkout, you will automatically be added to my subscriber list. My kids still play with all their LEGO!! We love to read! My kids have also always loved dot markers. Thanks for the great giveaway! My kids love those dot markers too! We have used all of those too! They are great sites! My preschooler loves to color and pay with play-doh! Those are a favorite in our house too! My preschooler loves to “design outfits” more than anything on earth. My kids LOVE anything messy. We live in the country, so we spend a lot of time outside. They like writing in mud and using sticks to make letters. Fun and educational! 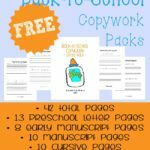 My preschooler loves her workbooks! She will do several pages at s time! She also loves to play with play dough almost daily. My preschooler loves to color, and cut out paper! Does yelling count? I kid, but singing and dancing are a favorite. I had a five year old who wasn’t ready for kindergarten either. He loves learning videos (especially musical ones), learning apps and computer games. Reading Eggs was worth the subscription! My preschoolers love to sit down and practice their letters, it makes them feel like they are doing “real school” like the big kids! Playing outside and playing with her younger sister! She has so many favorites! She loves pretending to be a vet or play restaurant. My preschooler loves art! I plan on including coloring and painting in as many lessons as I can for him! My preschooler loves to help me cook. Read and play learning games on a tablet. My preschooler loves to color with markers! My preschooler loves play dough. And dancing! This looks so fun! When my current 1st grader was 4, I gave her a pre-K workbook with two rules: do all the pages in order, and follow the instructions (no coloring everything purple or whatever). She set her own pace, sometimes ignoring it for weeks and sometimes doing ten pages a day. When she finished it, she and I both knew she was ready for kindergarten, and we started the next week. I’m so glad we did it that way. 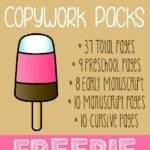 My pre-schooler loves anything that has to do with a glue stick or markers or scissors – basically anything her big sister uses, she wants too. I have a preschooler who learns through hands-on activities. We use Legos to help him learn! My daughter loves to build and design things just like her engineer daddy! Our favorite preschool activity is coloring. Great for hand-eye and learning colors and shapes. My preschooler enjoys play dough mats and math manipulative games! My preschoolers love arts and crafts. Thank you! Dinosaurs are a huge thing right now, he’s been watching Dino Dan, Dino Dana and Dinosaur Train on Amazon Freetime. It cracks me up to hear him spout off these 5-6+ syllable dinosaur names as easily as he says “cat” or “dog”. Our children (4.5 and 2) love reading! We read to them almost everywhere (at their request!). It’s our special time together. Little man loves anything to do with crayons, markers or paints lol. Rare occasions he likes to just cuddle up and let me read to him. Those are my favorite days. My preschooler loves anything hands on and is a great little artist! My kids like playing Legos and drawing. All of my preschoolers love to color and draw! My kids love coloring and Megablocks! Digging in the dirt, pretending to drive tractors, … Anything and everything outside. My Littles love to color. Drawing and painting is wildly popular at our house! Using tools with Daddy…especially screwdrivers! My son loves to sing and dance! My preschoolers new favorite activity is to “write notes” and put them in envelopes then he brings them to momma and daddy and reads them to us. He just turned 4 and can’t write so they are scribbles but I love the energy and imagination he puts into them! Drawing what the see and reading together. his favorite activity is swimming… but as far as school stuff goes he loves to paint or use stickers. My preschooler loves playing outside and trying to keep up with siblings. Her favorite activity is anything involving arts and crafts. My preschooler loves to color!! She loves to do schoolwork, because her siblings do it. I put that as my comment entry.. oops! My preschooler loves to build different things with Legos, but I would say his absolute favorite activity is coloring… On himself. She loves to play dolls for hours! My daughter loves games, puzzles and drawing. I would definitely have to say drawing. I just found tor site roday, and sas I missed the discount on this. I don’t see a purchase link. How do you buy it? I am sorry about that! I have updated the post to add in the product you can purchase!